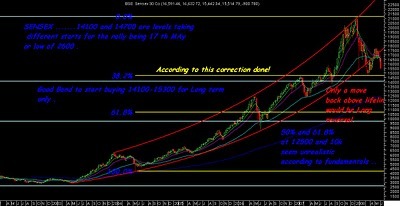 SENSEX 14100 -15300 LONG TERM BUY ZONE .. Follow up to my previous update: Do read this before getting into the current post. In the previous update it was said that 14200-14700 is where the bottom should be seen and buying could be done in dips and we would see stability by 1-2 week of April. And was stated we would take a fresh call after May for the long term view. After that we saw a low at 14677 close to 14700 . 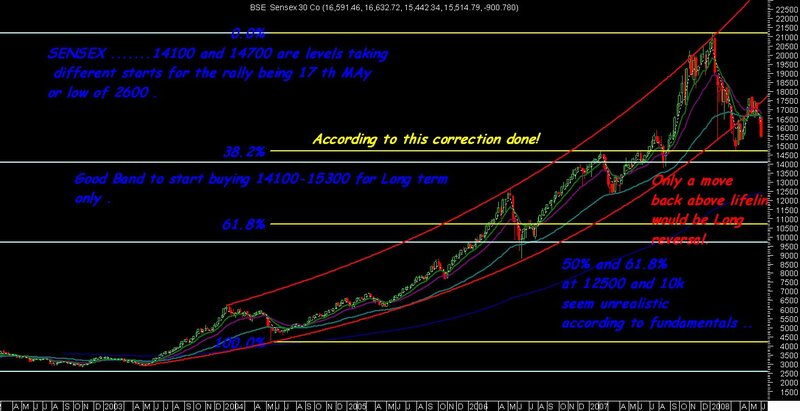 14700 was a level chosen coz considering the rally to have started fro 17 th May with a low of 4227 the 38 % correction came to 14720. Similar retracement was seen in Nifty . On another starting point seeing 2600 low of last 5-7 yrs the 38% retracement comes to 14100 approx. Technically had the markets sustained above lifeline the correction would be a part of the new high every yr pattern which was violated then. Such a move implies Sensex is seeing a major correction of the bull rally of 5 yrs for which it can correct 38, 50 or 61.8% . Fundamentally 12500 / 9800 ( 50 and 61 % levels ) dont seem to be realistic with P/E s as India has never traded below 10-12 . So technically the band between near 14100 +- 250 points is an important band for next 1 yr which should support any untoward occurences and if such a level comes buying would be a great opportunity for long term as 12500 possibility doesnt seem probable unless something unusual , unimaginable comes in. On fibonacci time basis we should see stability or bottom formation for short term by June 1-2 week. As that would be 13th week from March lows . BSE SENSEX and NIFTY may appear to higher then the lows but on a statistica and component basis a different picture comes out which has been mentioned roughly in previous posts. The above stats were one of the reasons to generate cash/exit at 17500 and 16800 breakdown and we still continue to maintain to stay on cash as many of the liked stocks will be available below JAN lows for quite some time as they are trading almost close to lows or 10-20 % lower. so investors wont be left out as there is no compelling reason for markets to jump 1000 points in a day but we have always seen 1000 points shaved of in 2 days . If an investor believes in the India growth story , has done brief research on investment picks then one can look to start accumulating particular stocks like SBI , RcAP , UNITecH , Gtl infra , RPL , Videocon Inds etc some of the good loooking ones in small quantities arnd 25% of cash at 15300 or below. The next 30 % be deployed at 14700-14200 and the rest 40 % be kept for stock specific lows or in Index panics or in a technical reversal either from 15300 or 14200 which crosses higher levels of breakout which will be covered later. But investors should not be expecting quick returns as markets would need a good consolidation phase to wither out the inflation, sub prime , US , global and other concerns. Although i have never never been in favour of Mutual Funds as an investment option but i believe there are lot of passive investors who would be fine with returns better then banks . So a good strategy which comes to my mind may not be ideal as i lack MF knowledge. Generally corporate workers tend to opt for MFs in Jan - March for Tax benefits. But in current scenario where in there is a probability of 10-15 % max downside in INDEX /STOckS over the next few months . Investors although would get 15% tax benefit so tax saving MFs would be a good option to BLOCK away money for next 1-3 yrs !! for better returns . WOULD like some MF investors to put some more light on a MF portfolio suggestion . Will be updating more on particular stocks in coming days. I believe many of the readers have benefitted from GENERATING CASH /EXIT/ Reducing Leverage Calls at 21k in Jan, 18800 , 18100 , 17500 , 16800 and 16100 crucial levels wherein every high point was discussed in the posts. Even yesterday it was stated 15990 as resistance and we saw a top at 15992 before cracking. 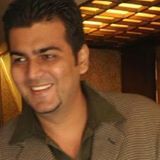 All the readers can give in few fundamental investemnt ideas on value basis in the comment box so all can be benefitted . As all may readers can take note .